President Obama’s appearance at the House Republican Conference retreat in Baltimore today was political PR at its best. Apparently, the White House insisted on bringing cameras. Good move. Obama has a talent for “playing the dozens” in a way that you’re slightly shamed into being your better self. Perhaps it’s that amiable demeanor. Perhaps it’s the “President as parent” posture. It’s the kind of exchange that doesn’t leave anyone destroyed. This was a talent share by men of my father’s generation. If they didn’t tease you or challenge you, that was a bad sign. You could be left speechless by the best of them, but came away knowing they cared because they knew you could be better. IMHO, this topped the State of the Union. And based on this event, maybe the President needs to have a little chat with the Speaker of the House. The first time I read A Peoples’ History of the United States by Howard Zinn, I thought, “here’s the Studs Terkel of American history.” These were the stories of the people on the streets and in the streets during monumental events in U.S. history. It confirmed my belief that the best way to learn from history is to know the stories of the people who are on the ground and affected by the powers that be. 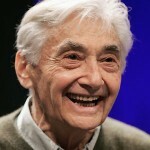 Only a few news outlets carried a head line that Howard Zinn died Wednesday at the age of 87. Right now the death of the reclusive novelist J.D. Salinger is the news of the day. Many Americans have a love affair with adolescence. It’s rebellion without responsibility. Zinn challenged us to come of age into our full adulthood as a nation. A Peoples’ History honored the narrative spoken while cuttin’ heads, the family history repeated at the Thanksgiving table, the body language of the laborer after a 10 hour shift. A celebration of Howard Zinn’s life and work is in the works in Washington, DC. To be continued. Enough opinions have been said and written about President Barack Obama’s first State of the Union address last night before the divided U.S. Congress and Senate. Just like we used to sit girl/boy/girl/boy in school assemblies, Congress should sit Republican/Democrat/etc. Just before the State of the Union, the Washington Post called me for a poll. Lots of questions about Mayor Fenty’s job performance, the school Chancellor, crime, and one question about President Obama’s job performance. “Personally,” I said, “I’m looking at the Congress.” I asked, “Is the next question about the Congress [and Senate]?” “No,” the pollster said. “Taxis. That’s the next question.” Nuf said, here’s the text from the State of the Union. I give it a thumbs up. Let’s see what happens next. I’m late to the punch, but HBO is still building the site for the new David Simon drama “Treme.” Simon is in New Orleans now filming additional episodes. UndercoverBlackman is also on the scene and blogging when he has the time. I’ve got a Mardi Gras party to plan at Eatonville Restaurant for the Fat Tuesday Food and Folklore. We packed the joint (the entire downstairs) Tuesday for the Rum! Food and Folklore event. If the Saints win the Super Bowl, New Orleans will have a Mardi Gras like none other. But still lots of work to be done in the Crescent City. Pour another libation. Just before their set at the old DC Space (now occupied by a Starbucks at 7th & E), the band members were rehearsing on my piano, ironing clothes, shooting the breeze on not so serious topics, and Mark was in the kitchen window practicing without an amp. Can’t disturb the neighbors too much. Mark credited George Benson as an influence on his own style. Not long after that pre-gig dinner, I heard Mark and his wife moved back to her home state Louisiana. This was waaay before Katrina. I had to call another friend who knows Mark Whitfield from back in the day. We all lost touch, but Mark has a website, and according to his bio he’s teaching part time at the Berklee College of Music in Boston (a prestigious music school for contemporary music including jazz – lots of jazz guys go there). One thing I always liked about Mark’s playing was it didn’t have the “Berklee Sound” of the time. I always thought everyone aimed to sound like Weather Report. But what a treat to see people pop up and make the music good again. 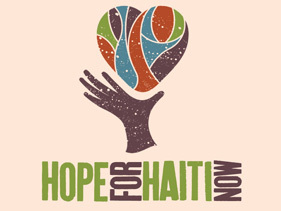 A “Hope for Haiti Now” album is available with the songs from the benefit concert. It is reported to be topping the charts. You can also download songs from itunes. 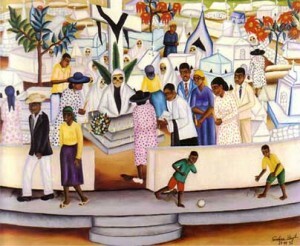 This blog also has a list of organizations contributing to relief efforts here.